or other sweet little treats. 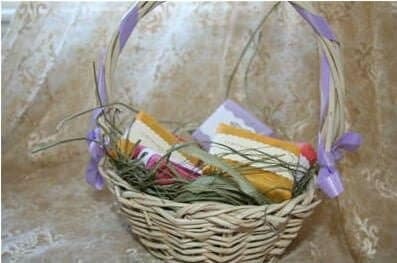 Designing these baskets are a great way to instill the true meaning of Easter to your children while having a little fun with Easter related themes. Optional: Use your desired spray paint to hide the original color of the pot. In the past, I’ve found that using a lighter spray paint color may blend in nicer and complement the look of your final product. Glue your jumbo craft sticks around your pot. Since it will be larger at the top than the bottom, you can expect there to be little gaps in between each stick. Don’t panic when you see gaps, just do your best to space them out evenly. Allow the pot to sit still for a couple of minutes before applying all other embellishments. Apply glue to a section of the basket. Make sure to cover the sticks well. Pour glue heavily on the glue coated sticks and shake off any excess glitter you may have. Continue around the basket until all sticks are coated. Allow the glitter to dry for some time before attaching the pipe cleaner. Depending on the size of your basket, you will have to twist pipe cleaners together to wrap around the bottom of the basket to secure. Repeat this step around the top portion of the basket and cut off any ends. Twist a couple of pipe cleaners together again as the handle which will be glued and attached to the inside of the basket.